The standard criticism of Social Media is that it is irrelevant. Our job in Social Media is to prove that statement wrong…over and over again. American Football is a great game for analogies. 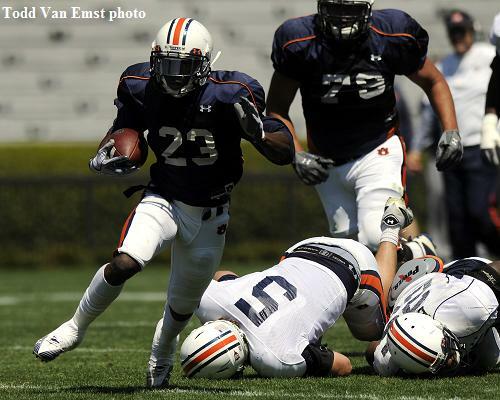 For many amateur, college and even some pro teams the running game is a huge part of the offensive attack. While the long spiralled pass over the top from the quarterback which drops into the hands of a wide receiver looks spectacular it is fraught with danger. A slight error results in the opponents taking over the football and attack becomes defence very quickly. Less attractive is the running game with a fast running back carrying the ball forward in small yardage gains – maybe only 3 yards at a time. Each down starts with two lines of tall and heavy linemen facing each other and the running back stood behind. While the running back gets the glory, the linemen do the work. the running game may be less attractive but it is the catalyst for successful teams. On the offensive side of the ball the linemen’s objective is to get in the way of wherever the ball is going and ideally to attack whoever is holding the ball. On the defensive side the objective is to use brute strength to make the whole and push people backwards so the running back can make a small gain. Social media for business is about moving the pile. Anyone can gather friends on Facebook and followers on Twitter but not make a difference for their business. In American Football you’d have three downs and then pass the football over. There’s no risk, no blood and no innovation. Initially, all you are looking for is to find what works: a weak link or a worthwhile target and then the progress may be painfully slow. You may struggle to get a retweet or to get any feedback at all and you’ll wonder whether anyone is listening or why even bother to do the work. The challenge is to set smaller milestones… in American football the objective is to move just ten yards in four downs. There is a great speech by Al Pacino in Any Given Sunday about fighting for every inch which sums it up. In Social Media it could be ten new relevant friends each week, two new journalist followers or five retweets. Keeping “Moving the Pile” in mind is vital. It keeps you thinking about the value of every follower you have and the followers you would love to have. There’s no point being in Social Media just to have a presence.